Copyright notice: Links to this site are welcomed. However none of the material on the site may be duplicated in any form. The copyright of the articles is the property of the authors. Copyright of the web pages is the property of David Courtney McClure. The history of the Ayrshire village of Waterside, a creation of the Dalmellington Iron Company, has been told in a number of publications, not least the book by David L Smith: The Dalmellington Iron Company, Its Engines and Men, Newton Abbot, 1967. It is not intended to cover the same ground here. However, from time to time the emergence of personal items allows us the see something of the fabric of the real life of the inhabitants. This is the case with the family of Robert Blaney and Sarah Crickard. Their granddaughter Sarah News left a number of photographs, postcards and letters, and copies of these have been made available to Ayrshire History by her grandson Brian Murphy. These form the basis of the following article. * refers to the parish rather than the village. ** The first-born son Patrick died in 1870. By the 1891 census Robert was 65 and a furnace labourer. His wife Sarah was 62 (two years older than she should have been according to the previous census). The other members of the household were: their third son Robert, now 34 and included, was a blast furnace keeper; Ellen (23) and Sarah (21) were 'assisting at home'; Patrick, the youngest and then (19) was employed as a blast furnaceman's assistant; finally there was Sarah's brother John 'Cricket' (Crickard), 45 and employed as a furnace labourer. Catherine and Charles had both died shortly after the 1881 census. A gravestone in Dalmellington cemetary laments their deaths and that of the first Patrick. In due course the names of Robert himself, his wife Sarah their son Robert were added. This is the stone erected in Dalmellington cemetary. It records the early deaths of three of their children, Patrick (19), Catherine (20) and Charles (19), and the death of their son Robert (49). The evidence in the report of McKerrell and Brown on the prevalence of infectious diseases in the mining villages suggests a possible cause. Their parents Robert (68) and Sarah (74) both lived to a relatively old age for the time. On 31st October 1893 their daughter Sarah married Christopher News and subsequently moved to Newmains, Lanarkshire where in the 1901 census they were recorded at 13 Hope Street. Christopher (37) was a pig iron lifter, working for the Coltness Iron Company; Sarah was 31 and they had two children, Christopher (6) and Sarah (4). Both births were recorded in Dalmellington; only in Sarah's case was the place of births specified as Greenhill, Waterside. There were just four residing at 17 Greenhill Row according to the 1901 census (31st March): the widowed Sarah (69 - the inconsistency of her age continued); her son Robert (44), a blast furnaceman; her daughter Ellen (33), a shirt maker; and a boarder, John Kane (13), still a scholar. By the 1911 census (2nd April) there was no record of the family in Greenhill Row, anywhere in the parish of Dalmellington or indeed in the county of Ayrshire. Sarah, the matriarch, had died in Waterside on 5th January 1905 and her son Robert on 5th August in the same year. This left only Ellen Blaney of the family in Waterside. In 1911 she too departed, emigrating with Christopher and Sarah News from Liverpool with their two children, bound for Sydney. Some flavour of the family's neighbours in Greenhill Row is given by the following table. Waterside Row, Occupations of Heads of Households according to the 1901 Census. Where the head is a woman the occupation of the eldest man is shown. * David Larmer was a maternal uncle of David L Smith, author of the book on the company. He was 29 in 1901, and his wife Agnes 28. His daughter Agnes (3 in 1901) was one of the correspondents of Sarah News whose letter survives. The iron company commenced operation in 1848. According to Smith, 'Many local men previously engaged in agriculture or woollen manufacture found work in this great new industry, but many others flocked in, Irish and Scottish Highland predominating.' To accommodate these incomers an entirely new village was built at the Waterside works. In 1851 there were 89 houses and 237 by the end of the decade. These consisted of three 'Rows', Greenhill, Park Yett and Barley Park. The pastoral scene these names suggest could hardly have been further from the reality, with the furnaces, railway lines for conveying coal, limestone and ore into the works and pig iron out, and the separate line of the Ayr and Dalmellington Railway, with further workings on the hillside of coal and iron ore mines and the kilns of the company's brickworks. Greenhill Row was also known as Furnace Row, more fitting for its position as the closest to the iron works; Park Yett Row was also called Brick Row. The company created other villages nearby on the hill, at Lethanhill and Burnfoothill; nearer Dalmellington, three miles from the works, were Craigmark and Corbie Crags serving mines in the area. The condition of the dwellings is described vividly in Ayrshire Miners Rows' 1913, published by the Ayrshire Archeological and Natural History Society (AANHS) in 1979. This consisted of the ' Evidence submitted to the Royal Commission on Housing (Scotland) by Thomas McKerrell and James Brown for the Ayrshire Miners' Union' in 1913. The Waterside rows, being constructed to house those employed at the iron works, were not included in the evidence. But the houses at Burnfoothill, also the property of the company, were investigated by McKerrell and Brown. Excerpts from their evidence follow, but the whole of their report on Burnfoothill may be read here. 25 inch sheet ot the area. 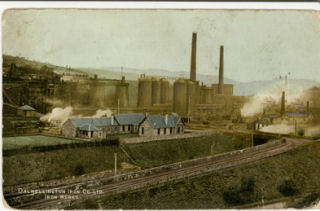 Dalmellington Iron Works in a postcard sent in 1908.